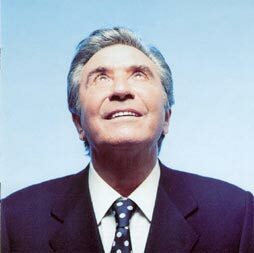 He was one of the last ones of the " grande chanson française” (great French chanson) in the 50s, an unprecedented voice known and recognized on the whole international scene, a true whole southern personality and without concession, the angers of which were memorable.GiIbert Becaud was born in 1927 in Toulon. At the age of 9, he follows the classes of the Nice Conservatoire. Settled during the Second world war in Albertville (Savoy) he serves as liaison officer with the maquis of Vercors. He leaves then Toulon to Paris at the Liberation time, where he becomes a shoemaker and a hotel page. He also begins to play the piano in cabarets and composes his first movies music. In 1950, he is the pianist of Marie Bizet, then he becomes the one of Jacques Pills, future husband of Edith PIAF. He goes during more than year for a tour on the American continent. He composes with Pills «Je t’ai dans la peau», a song sung by Piaf which becomes an american standard. Translated «Let it be me», this title will be sung by the EVERLY BROTHERS, Tom JONES, Elvis PRESLEY and Bob DYLAN. 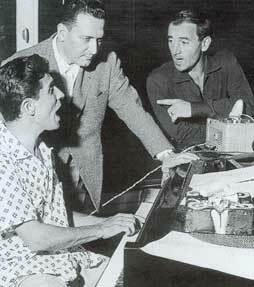 Upon returning in France, Becaud writes its first songs with Charles AZNAVOUR, Pierre DELANOE, Louis AMADE and Maurice VIDALIN. In 1953, he records his first disc at Pathé-Marconi. He wins the disc Grand Prix with «Quand tu danses».He participates in the reopening of the Olympia in 1954 doing the first part of Lucienne DELYLE’s show. The young spectators are so excited that they break armchairs. On February 17th, 1955, he makes his performance as a star in the music hall of the boulevard of Capucines. A Becaud style appears to fill with enthusiasm the youth : boisterous rhythms deeply influenced by american jazz, an exuberant voice which strikes its grand piano, an innate sense of the show. The man with the blue tie and white pitch is nicknamed " Sir 100 000 volts " by the press. The successes are linked : «Alors raconte» (avec LES COMPAGNONS DE LA CHANSON), «La corrida», «Le pianiste de Varsovie», «Le jour où la pluie viendra». In 1966, he’s acting in Marcel CARNE’s film «Le pays d’où je viens». In this time he records the credits of the legendary broadcast «Salut les copains !» on the Europe 1 radio. Moving on to more and more serious subjects, he goes out in 1961 «Et maintenant», a sort of desperate bolero sung afterward by Franck SINATRA under the title «What now my love». Simple texts, often with striking words, sung with energy in a theatrical way by a real man of scene who hated playback. «La solitude ça n’existe pas» in 1965. «L’important c’est la rose» in 1967 : Becaud reviews thousand facets of love and often undertakes in calls to tolerance: he wins the French song award in 1977 with The «indifference». «Désirée», released in 1982, is its last big popular success. In 1986 he creates in the United States a musical, «Madam Roza». Always vigorous and smiling, Becaud continues to fill concert halls in France and abroad, until December 18th, 2001 when this inescapable symbol of the music hall of the second half of the 20th century dies from a cancer in Paris. A Sublime posthumous album goes out on March 19th, 2002 with 13 new songs among which two extracts of its musical «Madam Roza». A great studio work realized by his son Gaya. Find more about Gilbert Becaud on Google !